Ahead of Thursday’s closely-watched earnings report, Blackberry-maker Research in Motion brushed aside a weekend story saying the company would separate its handset division and messaging network. The report came from the Sunday Times of London. (Subs req’d.) Waterloo, Ontario-based tech giant RIM issued a statement to TIME re-affirming the ongoing “strategic review” of its business. RIM has hired JPMorgan and RBC (Royal Bank of Canada) to help evaluate “strategic options,” which is often corporate-speak for a sale. RIM’s market value: $5 billion. The British paper doesn’t cite any sources in the report, but it says that Facebook and Amazon are both “potential buyers.” As part of this plan, RIM would either keep its enterprise-friendly messaging and data network in-house and license them out, or it would sell the division outright. The Waterloo-based company has been working with RBC and JP Morgan since earlier this year to conduct a strategic review, and The Sunday Times says the plan is one option drawn up during the process of the review. Another option, short of splitting the company in two, would be to sell a large stake to a corporation like Microsoft. Today, RIM is losing money – and market-share. Google’s Android accounts for 48.5% of smartphone owners, while the iPhone has 32%, according to research firm Nielsen. The Blackberry, by contrast, accounts for only 11.6% of the market, down from over 50% in 2007. 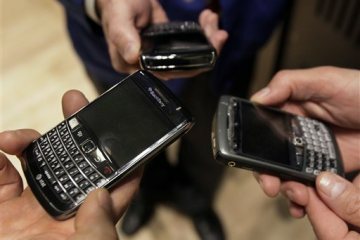 In March, RIM posted a quarterly loss of $125 million, compared to a profit of $934 million for the same period last year, as sales decreased to $4.2 billion, down from $5.6 billion. It was the company’s first loss in seven years. RIM’s market capitalization has dwindled to just $5.2 billion, a shadow of its former $80 billion value in 2008. With $2 billion in cash and a patent portfolio worth at least $1 billion, RIM is not at risk of going bankrupt any time soon, but its days as a standalone company may be drawing to a close. RIM reports quarterly results Thursday.